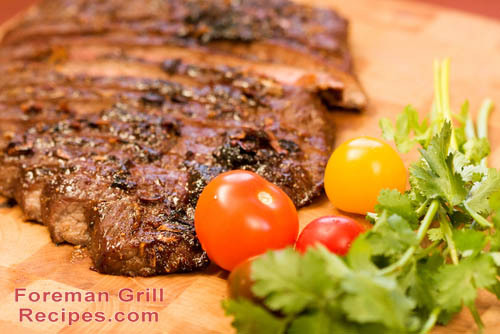 Grilling skirt steak on your Foreman Grill is quick, easy and delicious. Skirt steak is excellent for a meal, sliced up into steak fajitas, or on a hearty sandwich bun for a steak sandwich. However you decide to serve it, here’s the basics for a great skirt steak on your George Foreman Grill. Skirt steak is usually thin and does not need to be pounded out. However, if it’s a thick cut, go ahead and pound thin to 1/2″ -3/4″ thick. Place steak in a bowl with Worcestershire sauce and soy sauce and let sit in refrigerator for at least 20 minutes. Preheat George Foreman Grill for at least 5 minutes on high with lid closed. Sprinkle both sides of steak with salt and pepper and grill for approximately 4-6 minutes.